BodyART - the world's most advanced workout - combines both physical and spiritual aspects into one perfect training system. BodyART is a complete body programme, based on calm flows of motion, harmonious transitions and Far Eastern training methods. This ultimate combination is the personal choice of leading trainers and fitness enthusiasts worldwide. Therefore BodyART was awarded as "best training concept" two years in a row (2005, 2006) in the United States of America by the ECA. It's time for more! 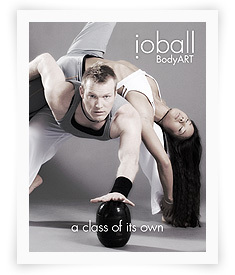 BodyART's Robert Steinbacher and Alexa Lê are going to introduce you to a new level of intensity that is a class of its own: io-Ball BodyART. With the inclusion of the elliptical io-Ball into BodyART there are unlimited different challenges and whole new intensities to discover in a very creative way. Redefine what you know about your balance-skills, harmony and coordination. The io-Ball's feedback to everything you do shows you even the slightest inaccuracies in your coordination, exposes any disharmony of your muscles and any lack of concentration. The new dimension of self-awareness in the io-Ball BodyART concept is the key to get closer to perfection then ever before. Join a class of its own!